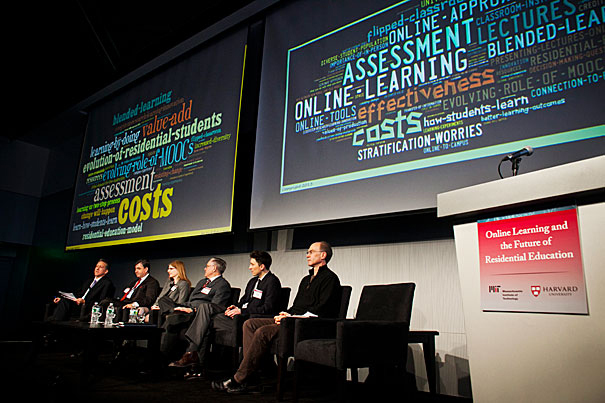 About 200 university representatives, leaders in online learning, and members of the media convened on March 3 and 4 for "Online Learning and the Future of Residential Education," a summit hosted by the presidents of Harvard and the Massachusetts Institute of Technology. When it comes to online education, the future is now. And it’s changing fast. That was an overriding message when the presidents of Harvard and the Massachusetts Institute of Technology (MIT) hosted a summit on March 3 and 4 titled “Online Learning and the Future of Residential Education.” An evening of dinner and discussion in the stately Radcliffe Gymnasium was followed by a day of interactive panel discussions at the chic MIT Media Lab complex. About 200 university representatives, leaders in online learning, and members of the media came to listen but also to engage. The online leaders included edX, the not-for-profit founded by the two host institutions, as well as Coursera, Khan Academy, and Kaplan. By design, the conference was, like many a modern classroom, flipped, so that interaction was emphasized over lecturing. Even with high-tech demonstrations, ranging from virtual-annotation tools to 3-D models of the Giza Pyramids, and a beamed-in discussion with Salman Kahn, who helped to lead the online learning movement, the concept of campus emerged as the real star of the summit. “It is simply a tool,” Sanjay Sarma said of online learning, reframing a phenomenon that others have hailed as a revolution, disruption, or new wave for higher education. Sarma, the new director of digital learning at MIT, meant to convey that, as with all breakthrough innovations, context matters. “Intel inside” or “powered by Google” are mere marketing efforts without the requisite smartphones or tablets. For Sarma, an authority on modern manufacturing, the best laboratory for learning remains the campus. With new technologies, in fact, the campus experience can be tweaked, bettered, and of course, in the tradition of MIT students, hacked. Anant Agarwal, president of edX and a faculty member at MIT, relayed two admissions success stories that began with clicks made halfway around the world. A student from Mongolia (who had to travel a great distance to find the nearest, lone Internet access point) and another in China who were taking Argawal’s edX course, MITx 6.002x, “Circuits and Electronics,” were so exceptional — performing at near-genius levels — that Agarwal made it his mission to help bring them to the attention of his own school’s admissions office. They both got into MIT. On the Harvard campus, the arrival of MOOCs (Massive Open Online Courses) and other digital dissemination platforms for teaching and learning have provided many faculty members with their first Hollywood closeups. “By putting their work out there for all to see, they can compare what they are doing with one another,” said Harvard Provost Alan Garber. Courses and lectures, no longer bound by classroom walls, have become sharable and even mashable, working together. These days, the best lecture on accounting can be dropped into an existing course like an add-on mobile app. Garber noted the positive pressure of HarvardX, leading many faculty members to rethink their teaching on campus and, more important, to proffer best practices, tools, and teachable moments. Rob Lue, professor of the practice of molecular and cellular biology and faculty director of HarvardX, distilled examples like these into what became the underlying question of the summit: How can the effective, time-tested DNA of campus bricks and mortar be woven into the fabric of what is happening online? The “primordial soup” is here, Lue said, and it is “ours” to stir and simmer it into something magnificent. MIT President Rafael Reif noted the “tremendous enthusiasm” at the conference. While admitting that he was “in a room full of believers,” he said that that no one shied away from the hard questions, from costs to institutional barriers to low completion rates of free online courses, to the potential further stratification of elite universities. Reflecting on the early lessons learned, Reif had a sense of measured optimism about the future of residential learning. What he called a “movement” was one that was happening from the bottom up. Driven by faculty eager to rethink their teaching and by students raised in an age where the online/in-person divide has disappeared (texting while talking while watching), university leaders like himself may eventually act more like coaches and Sherpas than top-down directors. Agarwal went one step further. edX, he said, was formed by Harvard and MIT to enable innovation and provide a sandbox for dozens of higher education institutions to experiment collectively with teaching, learning, and revenue models. Framed by a glass window overlooking the Charles River, the body of water that helped spawn two world-class universities, the possibility of being able to “rise all boats” seemed more than metaphoric.